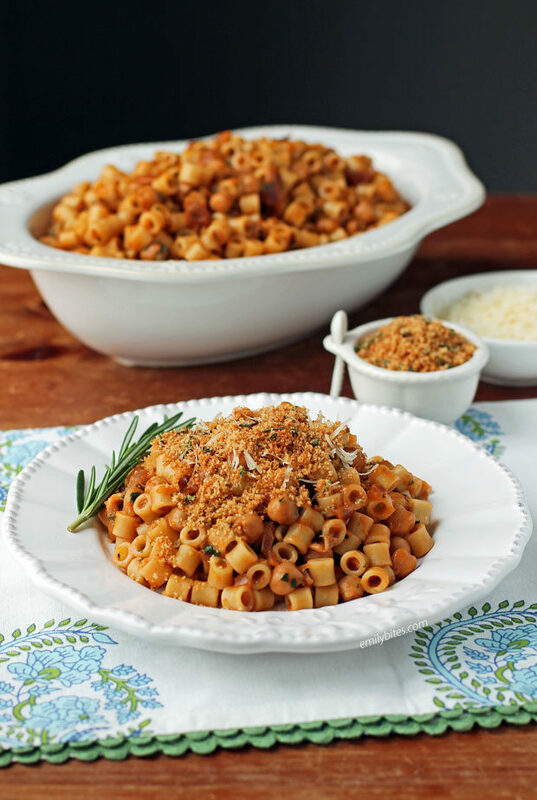 This Pasta with Chickpeas is a simple, hearty Italian dish that makes a lovely weeknight meal! I love a big ol’ plate of pasta when I’m craving comfort food, and this Pasta with Chickpeas totally does the trick. 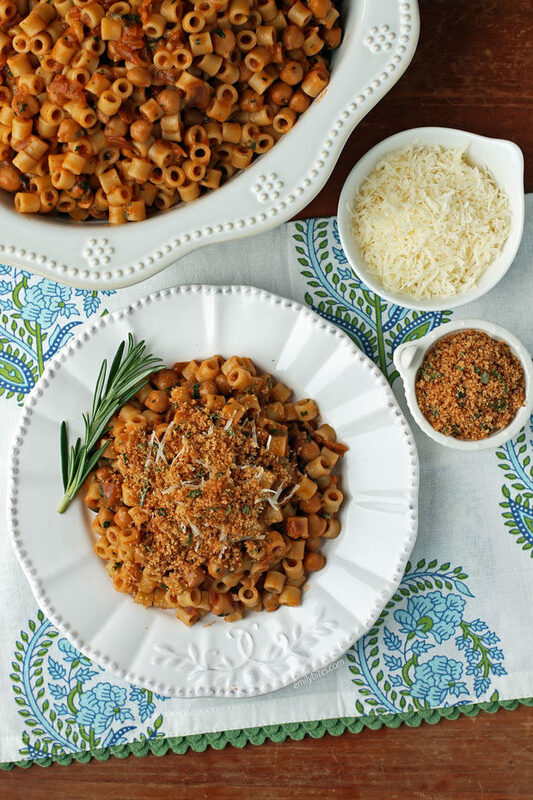 However, with the sweetness of sautéed red onion, the richness of tomato paste, herby flavor from the rosemary and parsley, and the crunchy topping of toasted breadcrumbs, this is not your usual pasta dish. In addition to the rich flavors from the sauce and topping, the chickpeas add protein and fiber, as well as a rustic heartiness I’m sure you’ll love. Plus, each 1 ¼ cup serving of this simple, comforting dish is just 351 calories or 8 WW Freestyle SmartPoints. I love serving this Pasta with Chickpeas as a meatless main course with a side salad or roasted vegetables, but you could also serve it as a side dish to the meat of your choice. It’s great either way! Looking for more lightened up comfort food pasta recipes? Check out my Butternut Squash Pasta with Bacon, Chicken Pot Pasta, Beef Enchilada Pasta Skillet, Turkey Sloppy Joe Pasta, Italian Wedding Pasta Skillet, Sausage Ricotta Pasta, Lemon Chicken Orzo with Tomatoes and Asparagus, Beef Stroganoff, Beefy American Goulash, One-Pot Cincinnati Chili Spaghetti Bake, Slow Cooker Kickin’ Chicken Pasta, Pumpkin Alfredo Tortellini Skillet, Cheesy Chicken Veggie Pasta Skillet, Sausage Tortellini Skillet, Tomato Soup Mac & Cheese, Chicken Cordon Bleu Pasta Bake, Spaghetti Pie, Spicy Sausage Pasta, Cheesy Taco Pasta, and many more in the Pasta section of my recipe index! Bring a pot of salted water to a boil and cook the pasta al dente according to package instructions. Reserve one cup of cooking liquid once finished. Drain the pasta and return it to the pot. While the water is boiling, drizzle a teaspoon of the olive oil into a medium saucepan and bring it over medium heat. Once hot, add the breadcrumbs, 1 teaspoon of the rosemary, and a sprinkle of salt and pepper and stir together until combined. Cook the breadcrumbs, stirring occasionally to ensure the bottoms don’t get too dark, for 1-2 minutes until golden. Transfer the breadcrumbs to a side plate and wipe out the saucepan. Place the remaining tablespoon of olive oil in the saucepan and bring over medium-high heat. When the oil is hot, add the red onion, garlic and remaining teaspoon of rosemary and stir together. Cook, stirring occasionally, for 5-7 minutes until the onion begins to brown. Add the tomato paste and stir together. Cook for an additional minute, stirring, until the red in the mixture darkens. Pour in the entire can of chickpeas, including the liquid, and the chicken broth and stir together. Bring the mixture to a boil and then reduce the heat to simmer. Simmer uncovered for 8-10 minutes until the sauce thickens. Add the chickpea sauce to the cooked pasta in the pot from step one and stir together. Add the parsley and parmesan cheese and stir until well combined. If needed, you can use some of the reserved cooking water to thin out the sauce to taste. Top each (1 ¼ cups) serving with two teaspoons of the toasted breadcrumbs from step two. I have to ask – where did you get that adorable little bowl with the spoon for the breadcrumbs?! This recipe looks so delicious and cozy by the way. I just made this (will have it for dinner later) but wasn’t sure where the 1C of reserved cooking liquid came into play??? Ah, sorry about that! I never end up using it, but you can put a little in to thin out the sauce at the end if need be.